You'll be £10.39 closer to your next £10.00 credit when you purchase Pirate Hunter. What's this? On 2 August 1708 Captain Woodes Rogers set sail from Bristol with two ships, the Duke and Dutchess, on an epic voyage of circumnavigation that was to make himfamous. His mission was to attack, plunder and pillage Spanish ships wherever he could. And, as Graham Thomas shows in this tense and exciting narrative, after a series of pursuits and sea battles he returned laden with booty and with a reputation as one of the most audacious and shrewd fighting captains of the age. He was then appointed governor of the Bahamas by George I with the task of suppressing the pirates who roamed this corner of the Caribbean and preyed on its shipping. He was equally successful as a privateer and pirate-hunter in an age when brutality and ruthlessness were the law of the sea. 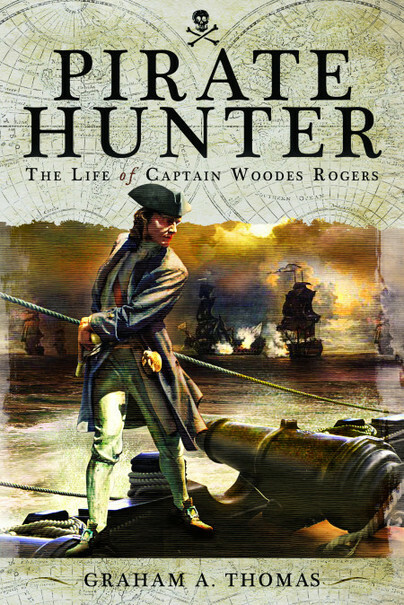 This study of Woodes Rogers is the first modern biography of an extraordinary adventurer. It is fascinating reading. Graham A. Thomas is a historian specialising in British naval and maritime history in the seventeenth and eighteenth centuries. He has also written on aerial warfare in the Second World War and Korea. He is currently the editor of the British Army Review, a quarterly journal on the doctrine and history of the British Army. His publications include Terror From the Sky: The Battle Against the Flying Bombs, Firestorm: Typhoons Over Caen, Operation Big Ben: Spitfires Dive-bombing V2 sites (with Craig Cabell), Pirate Hunter: The Life of Captain Woodes Rogers, Pirate Killers: The Royal Navy and the African Pirates and, with Craig Cabell and Allan Richards, Captain Kidd: The Hunt for the Truth.